Last weekend I found myself with an inexplicable urge to get myself a waterproof jacket, an empty flask for my shampoo, and a machete. 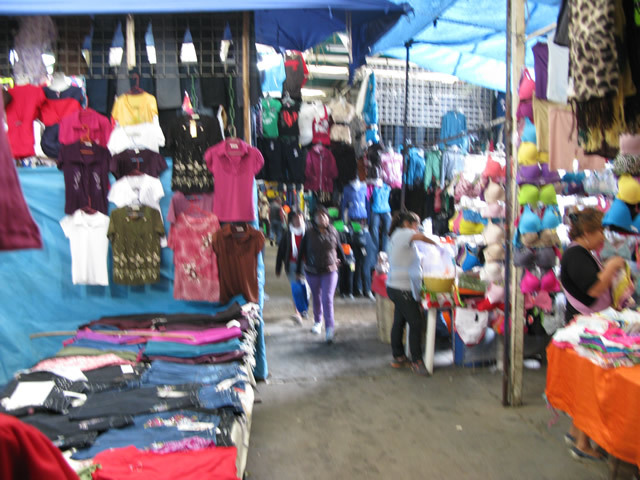 My hard work at the hostel is beginning to encroach savagely onto my free time, but, after rearranging a few duties, I managed to clear a couple hours last Sunday and head to the much-feared Mercado de Abastos. 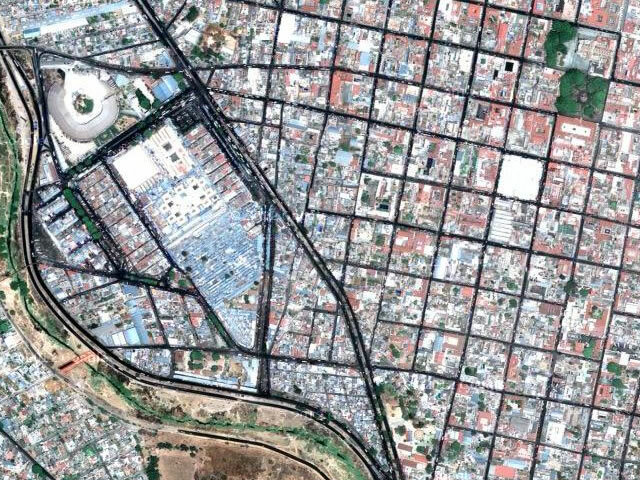 For starters, this lawless metropolis is a triangle about eight times the size of the average city block, running parallel to the Periférico city ring and limited by the Atoyac river –a winding, muddy stream laden with debris, garbage and (many a time) criminals. 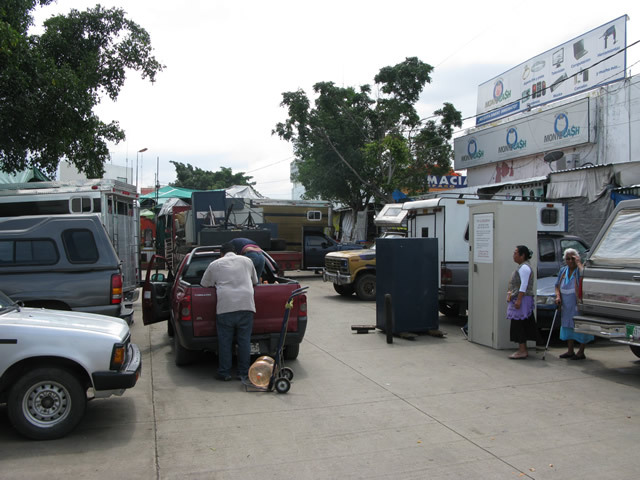 Admire to colossal MESS of the Abastos market! As you pass the food market and start heading out of the historical district, every trace of any fair-skinned, carefully dressed individual disappears. 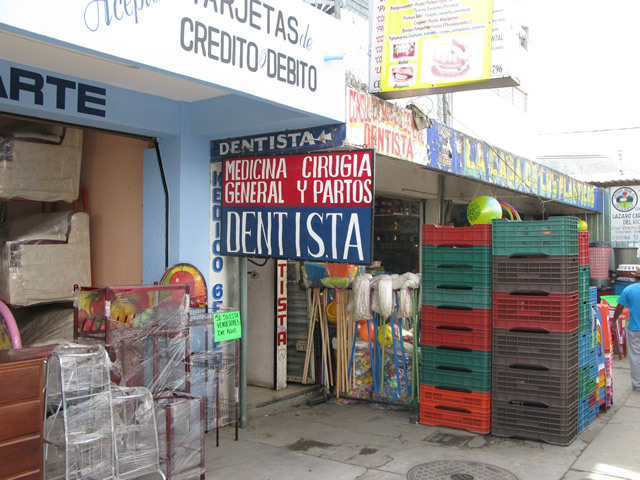 As I walk down the street, businesses turn from folkloric souvenir stores into hardware stores, key-makers and knife sharpeners. Every building and automobile starts showing signs of obvious disrepair; the newer constructions become hastily built, boxy concrete shells painted in bright colors and protected by security bars; cheap hotels in their majority. The ground gradually turns into a dusty surface with heaps of forgotten rubbish lying in the gutters and dried by the sun; the air thickens with the smell of fuel, rotten produce and worn clothing. ...and not a damn was given that day. Once you reach the rim of town you reach to the rim of civilization. Ahead of you lies a set of abandoned train tracks and the greatest jaywalking symphony to ever exist. 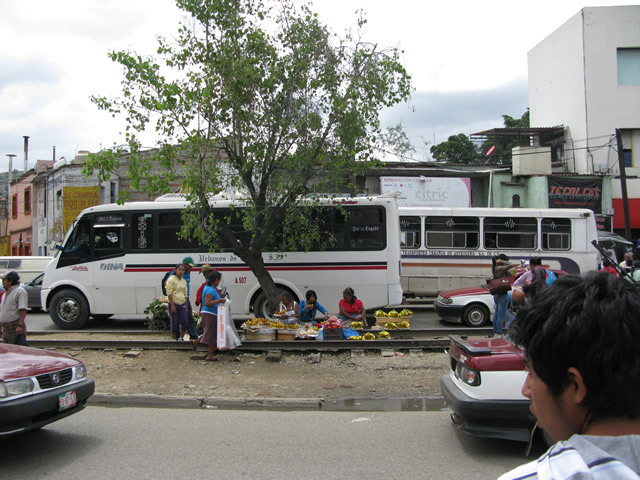 Many street vendors lay their blankets between the rails, as traffic runs slowly in both directions. Beyond these tracks stretches a sea of corrugated steel, concrete walls, acres of weathered posters from local bandas, and political grafitti every now and then. I walked along the rim on the sidewalk, to finally find an elevated walkway. One policemen on each side? Safest photo I have ever taken! Once on top, I saw the profile of one of the two policemen who guarded the walkway. As if the previous landscapes had not been sketchy enough, my intuition told me (shouted!) I was heading into something much worse, right into la boca del lobo –the wolf’s mouth. And there I was, right in the middle of the walkway, taking a picture and swallowing heavily. What lied before me was a monstrous rabble of merchants occupying a sprawl of unorganized shops, sheltered by two outer walls and a busy parking lot; easily a place where entry means no return. 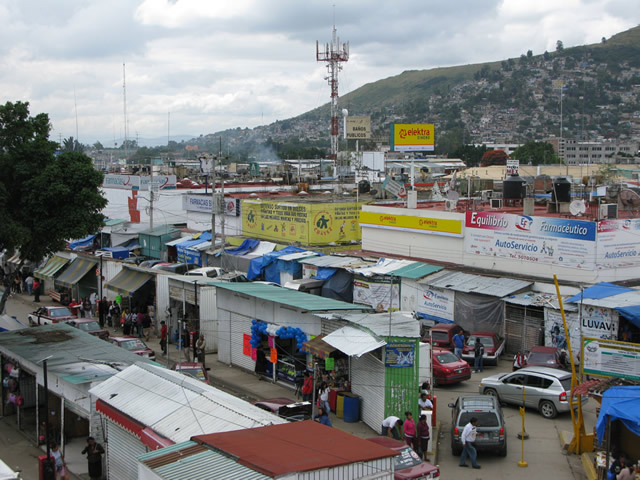 Later research through local news sources and co-workers revealed that the Abastos central market has been the background to scores of violent assaults and several homicides, many by stabbing. With as much courage as caution, I grew an extra set of eyes in the back of my head, and proceeded on my descent into the depths of Hell. Loading area right outside the big maze of the market. I did not feel it was safe to take pictures for the most part: given my unusual attire and complexion, I had way too much potential to attract suspicious glares. I also wanted to focus on embracing the experience: the frantic pace at which everything happened, the many items competing for attention and the combined smell of a thousand spices and meats, are all part of an overwhelming experience that saturates the senses. 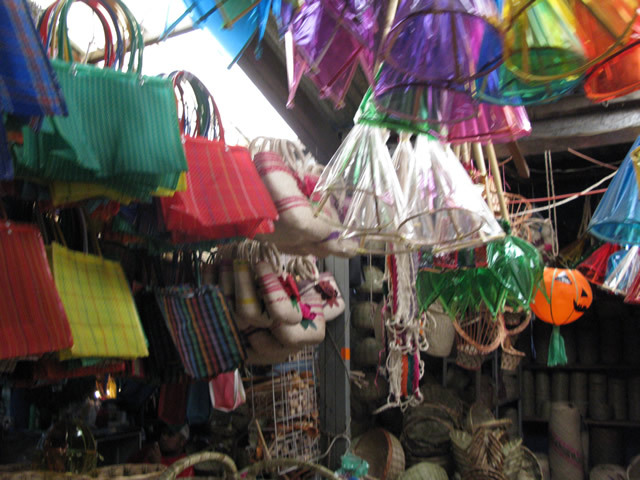 Colorful merchandise for display, right near the market's largest basket store. Extremely narrow hallways zigzag all over. This section was for brand-new clothing. Past the walls my sense of alarm calmed down a little, but not enough as not to dart into the nearest hardware store and get the machete first. For less than $10USD I was handed a long, stout blade made in Colombia, along with its sharpening stone, all wrapped with outmost care. With some relief and a renewed sense of safety, I kept on walking with a clearly identifiable newspaper silhouette clenched in my hand, lips pressed firmly in an unfriendly frown, eyebrows low to the edge of my glasses. A shrine of beautiful smells past the butcher and live chicken section. The following hour was spent trying up to seven leather jackets and unsuccessfully chasing after shampoo containers. As soon as I realized I had to get back to work, I headed out through a more open area dedicated to food, pots and wicker goods. On the way to butcher alley, I stumbled across a couple surgery clinics, built right in the middle of the market, on the second floor of a modest concrete structure. On the storefront of the opposing building one could indulge in a wide variety of wedding dresses for that special occasion. Clearly, and just like in any American mall, I found everything possible except for what I needed the most! Checklist for the day: buy onions and get my wisdom teeth pulled. 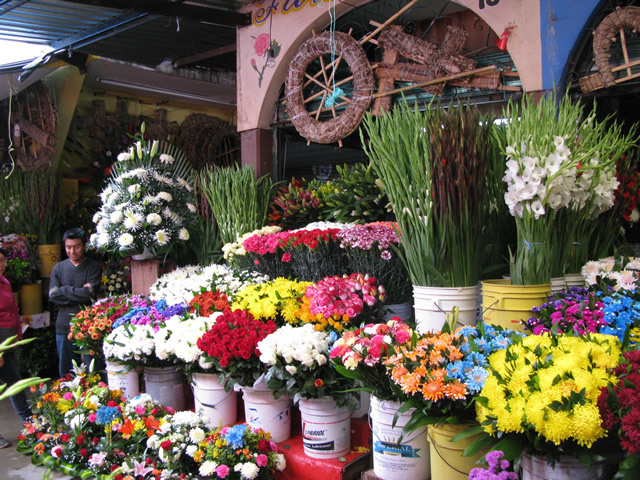 For a place that is recommended as the #4 of the greatest five world markets, the Mercado de Abastos inspires as much awe as it inspires fear. The locals will try to drive you away from it out of concern, and with good reason. If you so wish to ignore these warnings and adventure in the wolf’s mouth, do so with the outmost caution… and maybe a newspaper-wrapped machete in hand. This reminds me an awful lot of the market where brother and I ended up in Tecate looking for sandals for him. Only Tecate was fairly sleepy then before the crack down on the cartels, and people were always extremely sweet to an oddly dressed girl, so I didn't watch my back there any more than normal for a child of the ghetto.